A barn-style holiday home for families or small groups wanting to enjoy the great outdoors. This holiday home is very cozy, clean and spacious. The living rooms, dining, kitchen and Master bedroom all have lovely views of Mt Pihanga. We now have free 4G wifi. The Barn is a clean and cozy holiday house, large enough to sleep up to 10 people. It has 3 bedrooms upstairs, each with a Queen sized bed. The third bedroom also contains a bunk bed. There are two single fold out beds and a fold out couch as well, which can be placed anywhere in the house. The queen beds all have electric blankets for the colder nights. There are 2 full bathrooms. One upstairs and one downstairs. The downstairs one has a separate toilet. Downstairs there is a fully equipped open plan kitchen with oven, microwave, fridge, freezer, dishwasher as well as a dining area, a breakfast bar, a bar with small tv and a lounge with cozy fireplace. There is an additional lounge with a large tv and DVD player upstairs. We provide bedding incl. linen, towels as well as firewood. There is also a small supply of toilet paper, shower gel, dishwashing liquid and dishwashing tabs. The garage with internal access provides enough room to store your outdoor equipment such as skiis, snowboards, hiking boots etc. There is a gas barbeque and some outdoor furniture to spend some time in the garden. We have a small selection of books and games available. You can park your car on the property, either under the carport with covered access to the house or in the driveway. There is also plenty of parking space on the side of the road. Our hot water system is electric cylinder. Supply therefore is not unlimited. We suggest timing individual shower times if you are a big group. However most guests find this to be no problem. Turangi is located on the Tongariro River which is famous for its trout fishing, river rafting, walks and bike rides. It is a perfect base for outdoor activities around Mt Ruapehu. and the car parks for the world famous Tongariro Crossing are readily accessible in 25-35 minutes. Many different shuttle services are available or you can drive yourself. Enjoy the beautiful bays of Lake Taupo, all within a 10-15 minute drive or take a slightly longer drive of 30 minutes into Taupo itself. And after all your adventures take a soak in the hot pools of Tokaanu – only 5 minutes away from The Barn. * A maximum of 10 people. 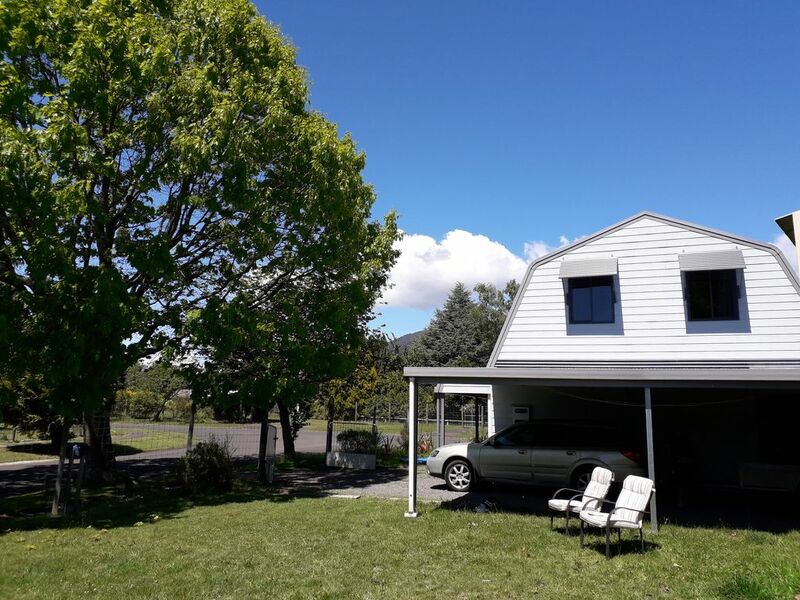 We live north of Wellington and have recently acquired The Barn as our holiday home to be closer to family and friends who are splattered across the North Island. When we are not using it ourselves we like to share it with other keen travellers, families and groups. We love being close to the mountains and Taupo lake. Being in between Auckland and Wellington also means that we can catch up with friends and family a lot more often because we can meet halfway. Minutes drive to lakes, mountains and hot pools. Ideal base for the Tongariro Crossing, skiing, snowboarding, river rafting, mountain biking, hiking, fishing, and so much more. There is a full bathroom upstairs and a bathroom (shower, sink) and a separate toilet downstairs. Parking on the property available ( covered and uncovered ). On-street parking available as well. Dining table with 6 seats downstairs. 2 flat screen tv's, one downstairs and one upstairs. Easy, friendly service. Great house, warm, functional, good size, plenty of parking space and easy to access. Thanks again! Nice stay in a peaceful location. Kids loved it and already started asking about the next trip to ‘the barn’. This place is great. It has everything you need and more! We were a group of mountain bikers exploring the area and having a garage, bbq and multiple fridges, and loads of space worked well for the bikes, beers and meals. Highly recommend! Lovely home, LOVE the fireplace, plenty of space, and everything you need. Very Clean and comfortable...beds are comfortable and this home has two bathrooms! Have stayed a few times now and would not stay anywhere else. Ticks all the boxes. Close to the shops and 35mins to whakapapa ski field. The Barn was absolutely perfect for our weekend away with a couple of other families. The Barn was absolutely perfect for our weekend away with a couple of other families. The fire is amazing and kept the whole place warm. Many many thanks to Neville, Nila and Jennifer ??? ?